Glorybound is a thrilling love story in the hard times of the American Civil War. Charles Coltrane is a young man that desired a promising future and wanted to control his own destiny. He was an ambitious self-sufficient businessman. He was caught between joining up with the Union army that was pressuring him into service or courting his new sweetheart Anna Lee Davis, a southern belle debutante. See where Coltrane’s travels take him and how he copes with disappointment and success in the business world. See how he deals with separation from Anna Lee and how their lives mesh while together and apart. Glorybound is an enthralling adventure and a piece of Americana. Charles Tokarek was raised in the small Midwestern town of Terre Haute, Indiana. The third of four children, his family enjoyed listening to music. About grade 8, country rock pioneers “Poco” captured his attention. “Poco” music and lyrics would become intertwined into the depths of his soul. As a grade school student Charles had his first job as a newspaper carrier. He was destined for a career in route sales and logistics as he had an interest in traveling, reading maps and U.S. geography. 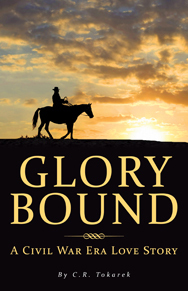 Glorybound is meant to be a thrilling love story in the hard times of the American Civil War. Although it is a fictional story, in addition it is a lesson in U.S. geography, business and what it takes to have a driving work ethic and intestinal fortitude. Charles currently resides in Indianapolis, Indiana with his wife Patty. He works for Nestlé Pizza Division in the field of logistics. Upon retirement, Charles and Patty hope to move to coastal South Carolina.